Vocational higher secondary education (VHSE) that revised its curriculum after 30 years to meet industry requirement is now sending its teachers to industries for a first-hand experience. “We have changed the way teachers are trained to ensure that they get to know the new curriculum in a better way . They will have training sessions with two industry experts and two expert teachers,“ said VHSE director K P Noufal, adding that training began almost 45 days ago. Teachers believe that with the new curriculum emphasising on skill development, students who pass out will be ready for the job market. “ As teachers we have to constantly upgrade our knowledge. 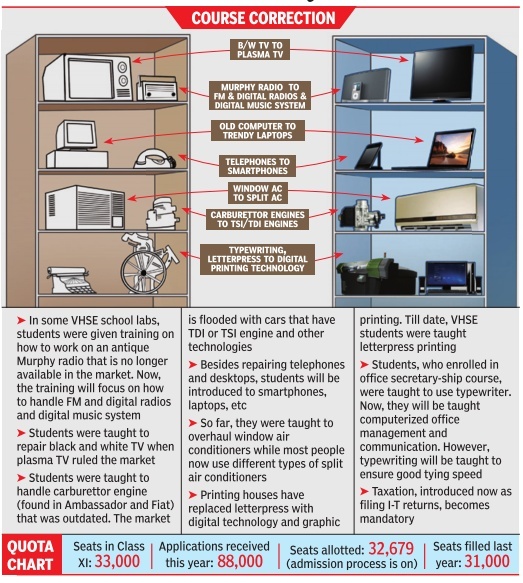 Before this revision, some of our teachers went out of their way to explain the latest technology to students,“ said Madhusoodhan M. Also, VHSE department plans to set up a centralized web portal for vocational students, with a video profile of 1,000 best students. Also, profiles of 10,000 students who have passed out would be created. “We will create a profile of the skilled work force and act as a facilitator. If a company requires an employee, they can directly contact the candidate,“ said Noufal. With the new curriculum laying equal focus on practical and theory , schools are trying to modernize their labs. Government had allotted Rs 3 crore for the purpose.Admitting that it wouldn't be enough, VHSE is in the process of tying up with additional skill acquisition programme (ASAP). “We will provide space to ASAP and they will provide necessary equipment to us as part of infrastructure development.While our students can use the lab from Monday to Friday , ASAP students can it during weekends,“ said Noufal. Meanwhile, schools are working hard to ensure that labs are fully equipped before classes start. “We are relying on MLA and MP funds to purchase new equipment. If need arises, we will approach corporates to help us as part of corporate social responsibility initiative,“ said PK Rajini, a teacher at GVHS, Kunnamkulam.